Also in the late 5th century AD, workshops probably located in Syria cut gems made of dark jaspers and, most notably, haematite, a stone often employed for magic amulets in the Roman period but rarely used for personal seals. 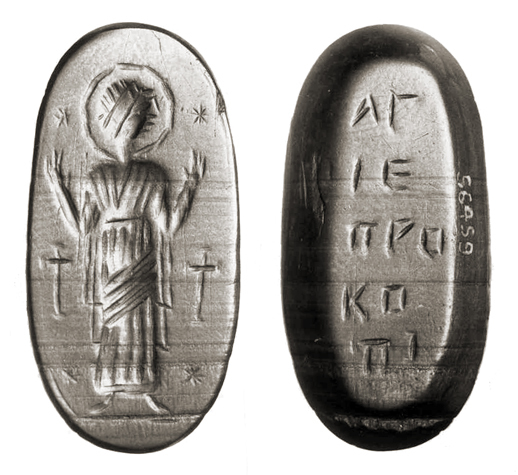 Although influenced by magic gems stylistically, these Christian examples did not make use of magic words or formulae, instead depicting Jesus, angels, and saints, sometimes labelled in Greek. 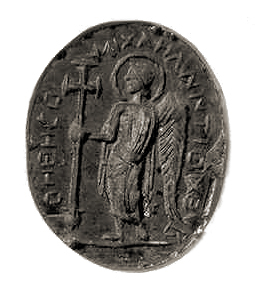 The archangel Michael holds a long cross. 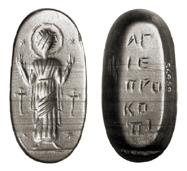 The Greek inscription reads, "Michael, help Antiochos". Munich, Christian Schmidt collection. Haematite, 16 x 13 mm. Two-sided gem. On the front is the standing figure of Saint Prokopios in prayer. The reverse side names the saint in Greek, "Saint Prokopios". London, British Museum. Haematite, 30 x 15 mm.